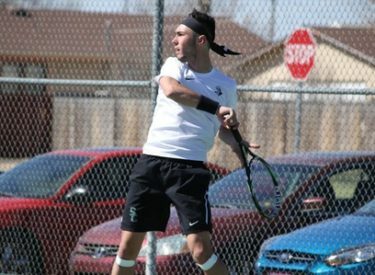 LIBERAL, Kan. – Seward Saints men’s tennis team comes out with another win making their overall record 11-1. Saints took on the Southeastern Oklahoma State Savage Storms and won 5-1 overall and only played till the clenched match. Doubles play was three long back and forth and emotional matches that could have been anyone’s matches. Finishing first was No.3, team Benji FInet and Carlo Izurieta who won 8-2 against Jeremy Despont and Danrich Kruger. No.2 was next with Saints Tim Lamare and Duro Opacic defeating Sandro Lena and Milos Vuckovic 9-7. Final was No.1 doubles team Nicolas Rousset and Hugo Lobo who played such an emotional back and forth match against Carlos Anez and Ondrej Nice and won 8-6. With the Saints up 3-0, they only needed to win two singles matches to clench and finish the entire match. The first person to give the Saints another win was No.6 Franck Soulerot who defeated Despont 6-4, 6-1. Next was No.1 Rousset who took a hard loss to the Savage Storms No.1 Carlos Anez 4-6, 4-6. No.3, Hugo Lobo clenched the match with a win over Nice in a super tiebreaker 3-6, 6-4, 10-8. The Saints next match will be Thursday, March 8th at home against Cowley College at 10 a.m. at Bluebonnet Park! LIBERAL, Kan. – Seward County women’s tennis team gets a big win against Southeastern Oklahoma State 5-1. The Lady Saints are now 7-2 on the season and on a two game winning steak. The ladies started off going 3-0 in doubles. No.1 was first to finish with Lady Saints Patricia Panta and Steffany Bermudez defeating Alexsandra Reljic and India Shiaelis 8-0. Following them was No.2 Maria Aveiga and Alena Macharova winning their match against Maria Martinez and Luisa Auffarth 8-4. No.3 team Martina Borges and Yursa Hegy finished after a long rally match winning against Nina Sergeev and Diana Budnik 8-6. The Lady Saints go into singles play up 3-0 and only need two more match wins to clench and win the entire match. First to get a win was No.1 Panta who made quick work of her opponent Reljic 6-3, 6-2. Following her was No.4 Bermundez who took the only loss for Seward against Auffarth 5-7, 1-6. Clenching match was won by No.2 Aveiga who won against Shiaelis 6-4, 6-3. The Lady Saints clenched the match and decided to not finish singles matches No.3, No.5, and No.6. Lady Seward County tennis team won 5-1 over the Savage Storms and are 7-2 overall in the season. The Lady Saints next match will be at home on Thursday, March 8th against rival Cowley College at Bluebonnet Park starting at 10 a.m.